I've been re-reading The Intelligent Investor by Benjamin Graham in order to document specific guidance for developing an investment policy and choosing investments. The first chapter deals with asset allocation for an investment portfolio. Different asset classes and sub-classes may be considered in asset allocation but for now, I'll consider stocks and bonds almost exclusively. 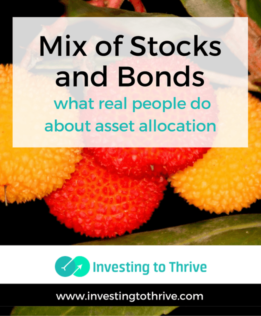 The idea underlying asset allocation (or the mix of stocks and bonds) is that a balanced portfolio is more likely to deliver steady returns that beat inflation. One that's too heavily weighted with stocks is subject to risk and swings in value (which could wreck a retirement plan); one with too many bonds might not generate returns that keep up with the rising cost of living. Developing a sound investment policy starts with establishing a desired mix of stocks and bonds. It continues with identifying the signal for rebalancing the investment portfolio. Rebalancing could happen at a predetermined time (for example, each year), when the mix deviates by a certain percentage or amount, or whenever new money is added to the investment portfolio. Establishing my ideal asset allocation ought to be based on portfolio theory along with my personal preferences, financial goals, and time horizons. By making this decision ahead of time, I'll be less likely to act on excitement, fear, or some other emotion and more likely to act according to a plan. This intentional approach should help me reach my financial goals with minimal fuss. In The Intelligent Investor, Graham begins with a default allocation of 50/50, holding 50% of an investment portfolio in stocks and 50% in bonds. He also suggests the possibility of holding between 25% and 75% in stocks or between 25% and 75% in bonds depending on the economic situation and personal preferences. The specific types of situations that Graham references are times in which 1) stocks are overvalued and a 25/75 stocks-to-bonds allocation could make sense, switching when 2) stocks are undervalued to a 75/25 stocks-to-bonds mix. The rationale is that I'll sell stocks when they're overvalued, capture capital gains, and reduce my stock holdings before the next cycle in which prices fall; when stock prices are low, I'll buy more stocks and enjoy gains when prices return to more normal valuations. Graham suggests rebalancing after a move of 5% in any direction. For example, if my target allocation is 75% stocks and 25% bonds and my stocks grow to 80% of my portfolio and bonds to 20%, then I'd sell off stocks and buy bonds to achieve the desired allocation of 75/25 stocks-to-bonds mix. Alternatively, I could buy bonds if I'm adding new money to my portfolio and achieve a similar result. Note that Graham cautions readers to develop an investment policy that accounts for economic conditions. Though he has a broad historical perspective over decades, he recognizes that circumstances could change dramatically and result in a change in policy. Investment advisors may suggest asset allocations weighted more heavily with stocks for investors who have long time horizons and an appetite for risk. However, recommended mixes may vary depending on the purpose of the investment account. A rule-of-thumb asset allocation has been to hold stocks in a percentage equal to 100 less my age with the remainder in bonds. For example, if I'm 55 years old, my mix of stocks and bonds should be 45/55 or 45% stocks (100-55=45; hold 45% in stocks) and 55% bonds. As I get older, I'd steadily reduce stock holdings and add to the bond side of my portfolio. A more updated rule of thumb that reflects increasing longevity is the use of 120 rather than 100. Following this formula, at age 55, I'd hold 65% of my portfolio in stocks and 35% in bonds (120-55=65; hold 65% in stocks). When I reach 75, my asset allocation ought to be 45% stocks and 55% bonds (120-75=45; hold 45% in stocks). When I look at the stock-bond mix of the Vanguard Target Retirement 2020 Fund (for those who plan to retire in about 5 years), I see that the allocation approximates the 120-less-my-age stock percentage. The Target Retirement Income Fund for those 73 years and older, though, holds 30% in stocks and 70% in bonds consistently throughout retirement. The commentary offered by Vanguard regarding fund options (there are other types of funds available for this age group) indicates that individual retirees may have different needs and preferences, therefore choosing different asset allocations. But what do real people, real retirees do about asset allocation? I found this article Why do retirees maintain high equity allocations? published on the Vanguard blog intriguing. As a group, the retirees studied enter retirement with a stock (or equity) allocation of about 60% in traditional IRAs and 75% in Roth IRAs. However, rather than reducing stock exposure over time, they tend to hold the same percentage throughout retirement. Maria Bruno, a CFP and Vanguard blogger, offers explanations for this pattern. But she also elicits comments from retirees. Her observations and the comments fascinated me, partly because I have tended to hold more stocks than bonds and thought of myself as an anomaly. The article's writer suggests that inertia is one reason for this asset mix. In my case, she'd be correct because change is hard. In addition, I like to be as hands-off as possible, and because stocks have (lately) grown much faster than bonds, my stock allocations keep increasing. They know about stocks but not so much about bonds. Many started investing in stocks when they were young. They grew their wealth through stocks. They understand how the stock market works, even if they can't predict its movements. Bonds weren't an integral part of their portfolios when they were younger so they're not sure how to invest wisely in bonds. Bonds and bond markets are mysterious. As a result, they continue to invest in stocks. Basic living expenses are completely or mostly covered by Social Security benefits and pension payments. Some have positioned their finances to survive on (hopefully) reliable sources of fixed income, rather than income from bonds. Prior to retirement, they paid off debts. During retirement, day-to-day living expenses are low.As a result, they believe they can afford to invest in stocks and take risks with their retirement accounts, which are earmarked for nonessential spending like travel. If stock market returns don't materialize, they can adjust their vacation plans while their grocery budgets remain intact. They have large cash funds to cover emergencies and short-term requirements. Generally retirees don't want to sell stock at low prices if (or when) the stock market falls. But rather than holding bonds, they hold cash. They keep enough cash to cover at least one year and possibly up to four years of of living expenses. Retirees are looking to get greater returns from bonds than what's available. In Graham's day (the 1970s and earlier), government and investment-grade bonds returned 5% to 9% or more annually. Today, similar types of bonds earn 1% to 3% per year. Some retirees have enough in bonds to generate the income needed to pay for basics and possibly more. Their asset allocations may be askew compared to ideal ones because they put extra funds in stocks. IRAs don't reflect their entire portfolios. Many retirees hold money in regular bank accounts or regular investment accounts, not just IRAs. They may also have significant real estate holdings (outside of their primary residences), which provide income and possible protection from inflation. So they have a desired asset mix but it's not apparent by looking at IRAs only. They have investing time horizons of 30 years or more. Longer time horizons indicate a higher mix of stocks. While stocks may fluctuate in value in the short term, they'll tend to grow in value over longer time periods.A 65-year-old retiree today could live another 30 years or more, compared to shorter life expectancy when rules of thumbs were first developed. So retirees may need greater growth in their portfolios to sustain a long life. In addition, retirees may want to leave an inheritance for their children or grandchildren. So they may hold more stocks in a Roth IRA that's earmarked as a financial legacy. Pay close attention to my budget in retirement. Ideally, I could fund my retirement with Social Security and pension benefits along with interest income from bonds or cash holdings. But I'll need to pin down my budget in order to determine funding requirements. Part of this process will be separating needs from wants. Consider increasing my bond holdings to cover income requirements. This process doesn't mean that I'll aim for a certain mix of stocks and bonds. Instead, I'll focus on generating a certain amount of income from bonds. Look at fixed income annuities. Certain annuities can give me a regular source of fixed income for the rest of my life. Learn more at Income Annuity Basics. Keep building a cash cushion. As I discussed in this article on why to put money in a savings account, I haven't held much cash in my investing career. But I am coming around to the idea that I need to hold a few years' worth of living expenses in retirement. Research which accounts may be ideal for holding stocks or bonds in retirement based on tax laws. Now that I've begun to develop a plan for asset allocation in retirement, I realize that I could also consider what accounts could hold stocks and which could hold bonds — and whether that would make an appreciable difference in my tax bill.I'll likely have a traditional IRA, Roth IRA, and regular taxable accounts in retirement. At first glance, it might make sense to hold stocks in a Roth IRA and regular taxable account with bonds in a traditional IRA. But I'll study this scenario to determine what might be best. I enjoyed learning about how real people think about asset allocation. I was glad to discover that I wasn't alone in having concerns about bonds and using cash as a safety net under current conditions with low interest rates.